Home » Diet » Top 5 Health Benefits of Nice Cream! Nice Cream is becoming popular as a healthier gluten-free, low-calorie plant-based alternative to ice-cream which satisfies your sweet tooth. Best of all you can feel good indulging in it -whenever you want! You can have nice cream for breakfast, lunch, dinner and even as a go to snack or dessert. Nice cream is made up from bananas that have been peeled, chopped and popped in the freezer ready to be blended up for a soft serve. What’s more, you can add your preferred fruits, nuts, seeds, chocolate, spreads, flavourings and more for a truly personalised taste experience. So, if you’ve never tried it, you’re in for a treat, simply read on for our Top 5 Health Benefits of Nice Cream! Bananas are amongst the most important food crops in the world. They are packed with beneficial nutrients such as potassium which is good for your heart health as it contains antioxidant flavonoids which helps reduce the risk of heart disease; carbohydrates which provides your body with energy, vitamin B6 which makes antibodies to help you fight infection, vitamin C to help you build a strong immune system and magnesium. Bananas are a healthy source of dietary fibre which contains large amounts of resistant starch and pectin. Both the resistant starch and pectin act as a probiotic for your body which helps ferment bacteria, aiding the growth of beneficial gut bacteria, healthy intestines as well as cleaning your colon. 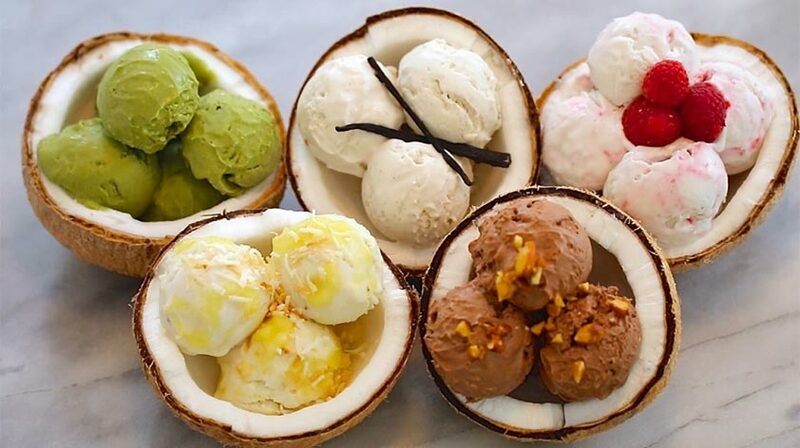 Nice cream is made up of all-natural ingredients. The fruits you choose contain only naturally occurring sugar (fructose) and you lessen the chance of ingesting chemicals still further if you happen to go for organic or own-grown produce, and there aren’t any other artificial ingredient-nasties! The potassium in bananas helps lower your blood pressure by easing the tension in your blood vessel walls which also has a positive impact on your cardiovascular health. Potassium is also known to reduce excess sodium found in your body. Bananas contain the amino acid tryptophan which is known to be a mood-boosting carbohydrate, as, in the conversion process it creates a mood-lifting hormone, serotonin.